Schools today are too disconnected from the real world. For me, this started as a mission to identify the best educational experience in the world for our children. Mumbai’s Realty major Marathon Group has introduced Big Picture Learning System, which originated in the US, in India with the launch of its first educational institute Next School in the city. The school aims to personalise a child’s education, while giving them experience in the real world through mentors and internships. 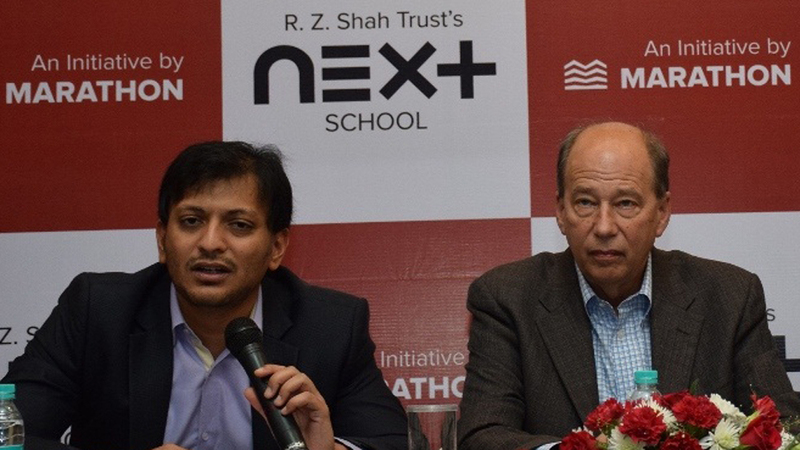 Briefing about the kind of gaps the school is trying to fill in India like fee structure, investment among other things, Parmeet Shah, Founder & CEO, Next School, spoke to Educationbiz.com on the sidelines of the press conference that announced the development. Here are excerpts from the interview. What inspired you to bring Big Picture Learning education system with Next School in India? Schools today are too disconnected from the real world. For me, this started as a mission to identify the best educational experience in the world for our children. One that prepares them not just for today, but for a future none of us can predict. After 6 years of research and development in Netherlands, Thailand, Australia, UK and USA, I have found the best educational experience that is Big Picture Learning. The model is appreciated by US President Barack Obama and Bill & Melinda Gates foundation. When we visited 7-8 Big Picture Schools in the US and around the world, I learnt that the school is about kids running their own business like making films, developing software, apps developing prosthetic limbs, designing a game engine for virtual reality among other things. Initially we are offering education up to 7th grade. In the future, we will expand to till 12th grade. There will be dedicated teachers working individually with 15 students for more personalised attention. With this school what are the core gaps in the Indian education system that you are trying to fill? In the current education system, there are issues with the effectiveness and productivity and the Next under Big Picture Learning is going to fill that gap. The model puts students at the centre rather than the teachers. Along with focusing on academics we are concentrating on connecting the passion and talent of a child to the real world. And by virtue of this we can address the needs of not just of academics but of the other aspects. Are teachers undergoing any kind of special training? Our teachers have gone through extensive three weeks training program in the US, where they visited many schools and studied how the model works. They also underwent the similar training in Australia. What is the reaction from the parent’s side? So far people have received this idea surprisingly well. This whole paradigm has come from our conversation with the parents and the kind of frustration they have been facing with the current education system. Next school is a not for profit IB school and for now IB is one of the most economical in the city. Initially our fee is starting at Rs 1.45 lakh a year. Given the kind of facilities that we are providing, collaboration with Big Picture Learning and the teachers’ training, the cost of operations will be higher, so down the line we will look at slightly higher fee in future. Will Next be focusing on creating workers or entrepreneurs? The current education system is based on industrial age values. It makes students follow the instructions and they do what they are told. But these are not the skills that are valuable in the modern world. IB focuses on what our children should be able to do. What they should learn, what skills they should possess. Next under Big Picture Learning focuses on how education is to be done, how to pay attention to the children, to their passion and needs. Our school will unleash the curiosity, the passion and talent of the children. There will be a lot of entrepreneurs, child prodigies coming out of Next. What is the initial investment that you have put in? Marathon is going to chip in the land and building into the project and in the first phase we are investing around Rs 50 crore. Hence, we are not looking at any kind of ROI as this is a non-profit initiative. Will you opt for franchisee model for future expansion? Well that is not the way we work. The Next is the mission that we have launched and we are not thinking of franchisees. We haven’t yet figured out what kind of arrangement we will be having. We will ensure that all kind of schools have access to Next School kind of ideas. What is your aim with Next School in India? We are focusing on getting the first school up and hoping that this will be an exemplar for other schools. Simultaneously we are committed to propagating the Big Picture Learning system in India. We have already announced the R&D and consulting arm which will attract other schools to adopt our model. Thus, with strategies and plans in place, Next School plans to create a big impact on the education industry by bringing in efficiency and effectiveness not only in academics but other fields too. Digital Education: the next big thing..